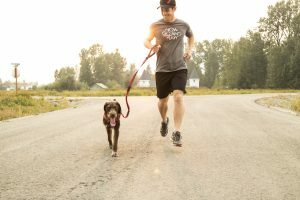 For our third post in this series we’re going to cover the dog running gear that will be critical to ensuring you and your four-legged training partner have a fun, productive and safe workout. Collar or Harness? Certainly, whether your dog wears a collar or harness for everyday walks and around the house will play a role in this decision. You want to ensure your dog is comfortable with the gear choice you make. However, for the most part, this decision comes down to the level of physical control you need to have over your dog. If your dog is really well-behaved on a leash, doesn’t pull/lunge and responds very well to verbal commands, then a collar is a great choice. 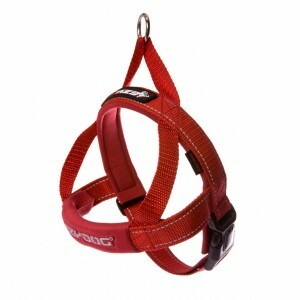 However, if you have any concerns about controlling your dog or if they they pull/lunge at all, then a harness will give you much more control and ensure a safe run for both of you. Hand-held or Hands-free leash? This is actually very similar decision criteria to the collar vs. harness question and ultimately comes down to how well you have leash-trained your dog. A hands-free running leash is the ultimate in running comfort, however it can be dangerous if your pooch is not well-trained. In many cases, for dogs new to running, starting with a hand-held leash is the best idea with the goal of graduating to a hands-free leash once you are both comfortable with your level of control. 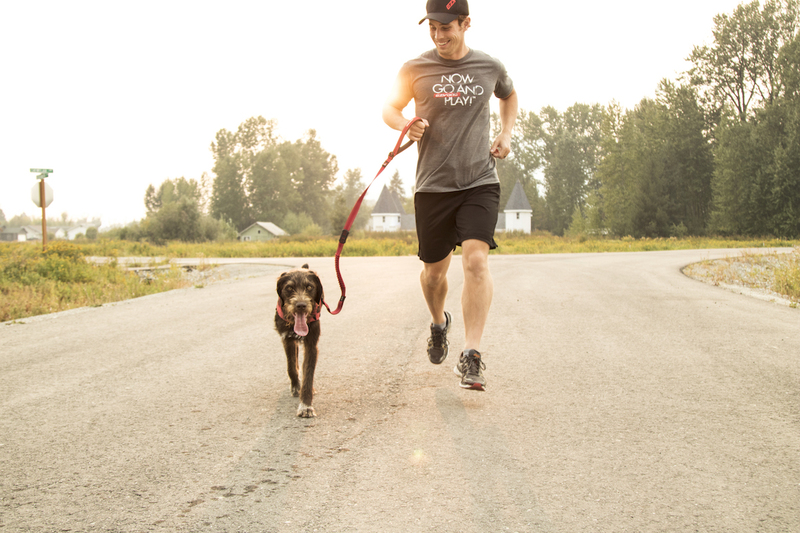 Now for the fun part, let’s take a look at the specific gear for running with your dog! 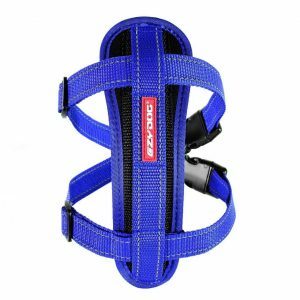 Standard Dog Running Harness – The EzyDog Quick Fit Sport Dog Harness is designed to have the support and control of a harness with the comfort of a collar. 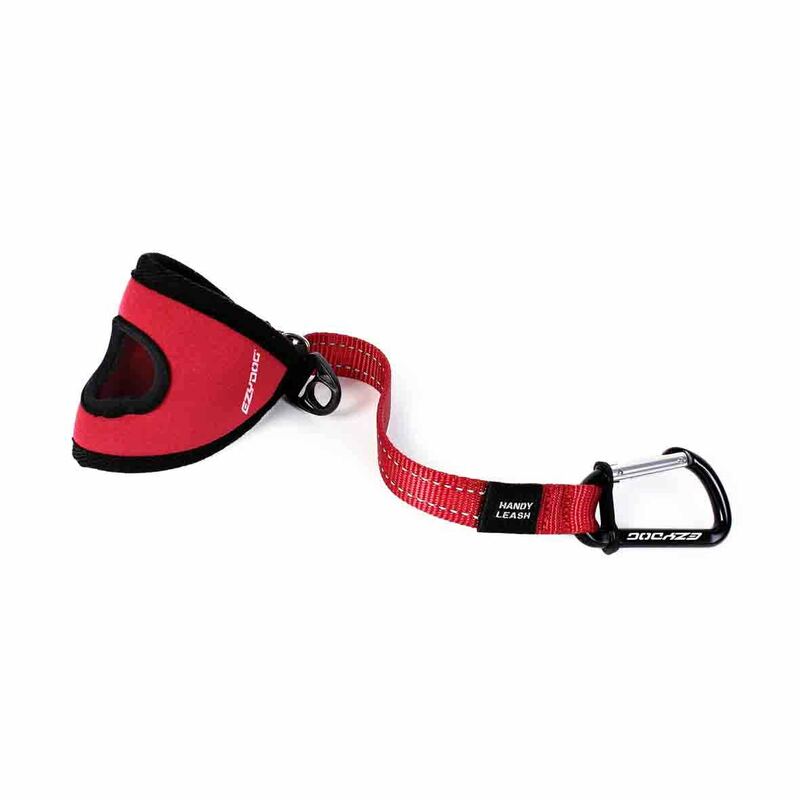 Used extensively for running, flyball and other sporting activities, this easy-to-fit harness is so comfortable that it can even replace your dog’s collar full-time. 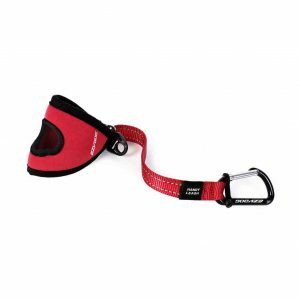 High-Control Dog Running Harness – The EzyDog Chest Plate Dog Harness provides the ultimate in control and comfort for pooches that sometimes pull a bit too much on the leash. It’s highly adjustable and conforms to your dog’s chest for a custom fit to avoid chaffing. It also remains very stationary which is great for control and comfort. 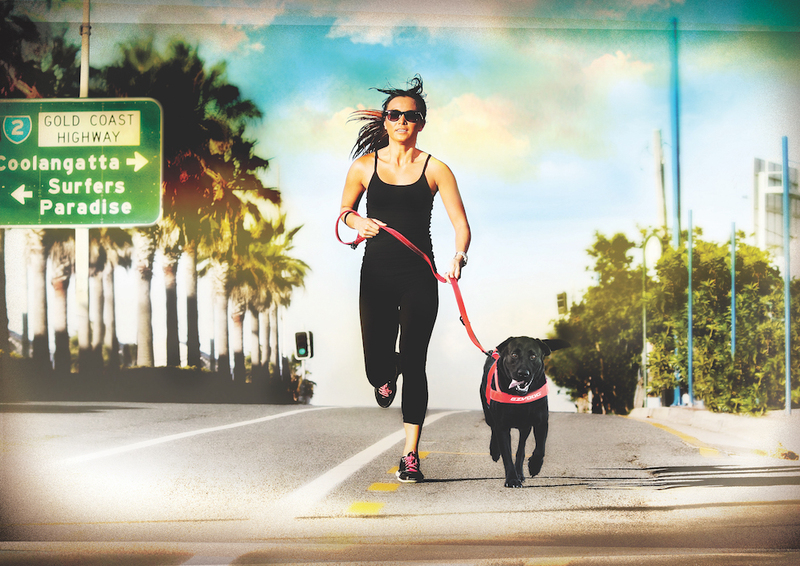 *All EzyDog dog harnesses are built with reflective trim for nighttime running safety. Everyday Dog Running Collar – The Neo and Neo Wide (for large dogs) are perfect everyday collars that also work excellent for running with your dog. Made with neoprene (wetsuit material) and reinforced with with heavy-duty nylon webbing, they transition from the road to the trail to home easily. Waterproof, easy to clean and none of the “dog smell” make these an excellent hybrid collar option. 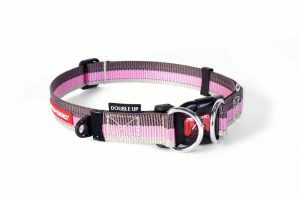 Extra Secure Dog Running Collar – The Double-Up Collars are an excellent choice if your dog is particularly large, strong or has a history of breaking collars. Two stainless steel d-rings provide twice the strength and security of a traditional collar and take the pressure away from the easy-access buckle. Dog Running Collar to Prevent Pulling -The Checkmate Dog Training Collar is a martingale design collar that provides significantly more control over your dog without the risk of choking and assists in preventing escape. When the Checkmate Collar is properly fitted, it will be comfortably loose without your dog noticing it much until the dog begins to pull. *All EzyDog dog collars are built with reflective trim for nighttime running safety. 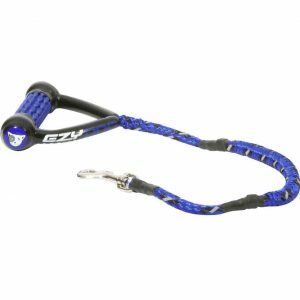 Everyday Dog Running Leash – The Cujo Shock Absorbing Leash was EzyDog’s first product and the Original Shock Absorbing Leash. The firm wakeboarding no-slip handle and short length are engineered to give you great control over your dog while still making it comfortable for both your pet and you. 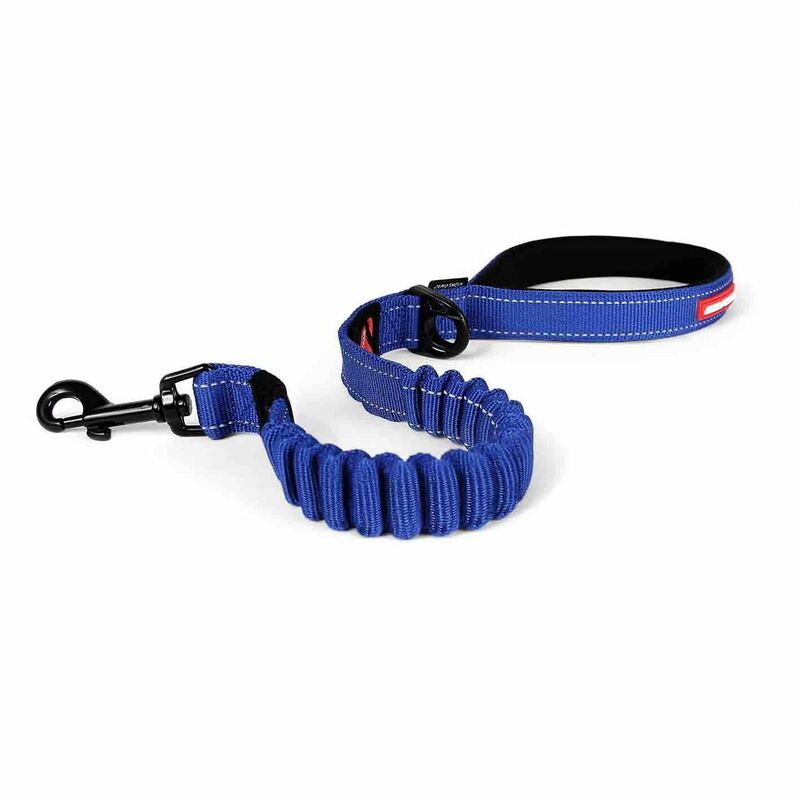 Comfortable, secure, short shock absorbing dog leash design gives your full control over your dog while on your run and 6 inches of shock absorbing stretch for those still in training. No-Pull Dog Running Leash – The Zero Shock Leash is the best option for a dog that struggles with pulling, or a dog that is still in running/walking training. 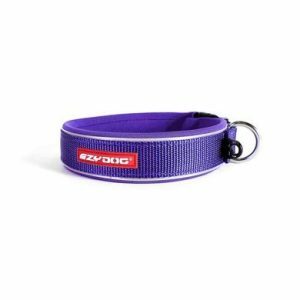 Built with EzyDog’s patented Zero Shock Technology, this leash drastically reduces the strain and pull on both dog and owner. A perfect option to get your 4-legged friend trained for runs and ready to move into a hands-free option. Hands-Free Dog Running Leash – The Road Runner Leash is the ultimate running leash for the well-behaved dog. 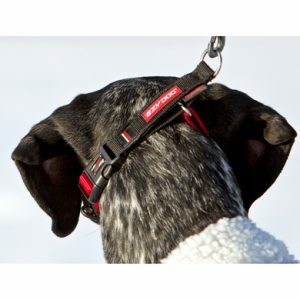 The sliding side-release buckle allows you to alter the length of the leash or unclip to wear it around your waist, shoulder or hand. When worn around your waist with a well-trained dog, it gives you the ability to maintain perfect running form while at the same time keeping your pooch on-leash and safe. 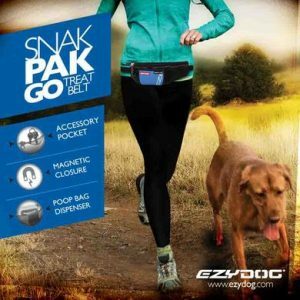 Treat Belt – quick, easy access to dog treats in a convenient belt that includes a poop bag dispenser and accessory pocket for keys, wallet, phone, etc. Investing in the time, training and gear you need to turn your pooch into your training partner will pay dividends for you both over the long run. What can be better than a running companion that is always ready to go, will follow you anywhere and never complains about the path you’re taking!